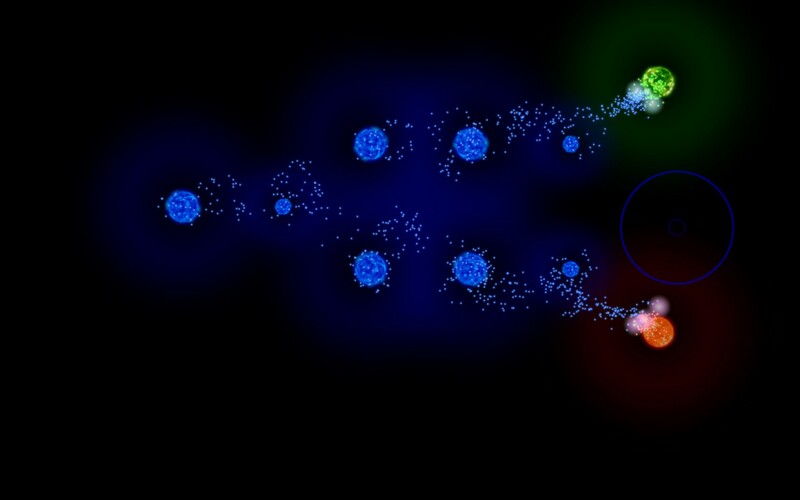 The Refined Geek » Auralux: The Essence of Real Time Strategy. Auralux: The Essence of Real Time Strategy. If survival horror is one of the game genres that I tend to rate poorly because of my internal bias against them then real time strategy is the genre that I find myself rating consistently higher for the same reasons. This could be some kind of survivor bias that led me to drop many RTS style games early on in their lives before I could make it to the end to review them (Company of Heroes comes to mind in this regard) but it’s probably more due to my gaming roots being firmly planted in this space having whiled away many hours on the RTS classic, Dune 2. You can then imagine my intrigue when Auralux, a game from independent developer E.B. McNeill, claimed to be the very essence of RTS, cutting away all the peripheral elements until the game was refined to its core. 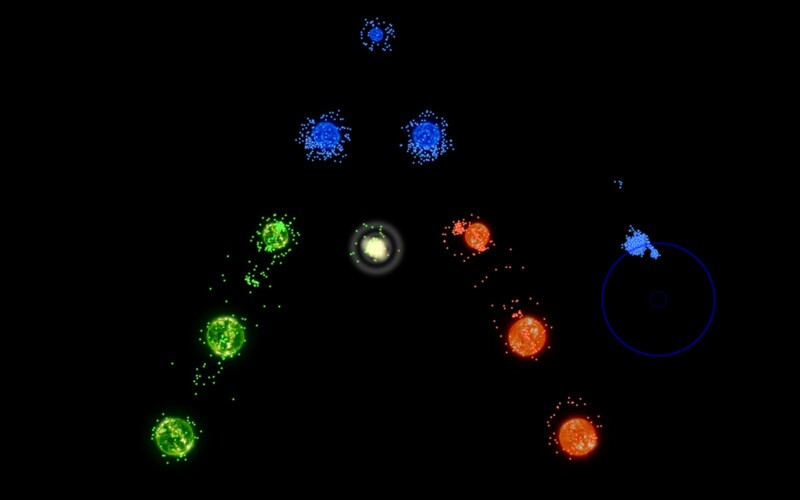 Auralux, like many independently developed games, has had to make choices as to what needed to be included in the game and what should be excluded. For Auralux this means that there is no story to speak of, you are simply a sun orbited by little dots who needs to take over all the other suns in the area whilst competing with 2 NPC suns who are doing the same thing. The introduction to the game is also quite thin on the ground as well but considering that there really isn’t that much to explain it actually suffices quite well. Your missions start out easy but as time goes on they get increasingly more difficult but you’re also blessed with some additional options to make your time with Auralux much more enjoyable. The graphics of Auralux are incredibly simple with the most complex item on the whole screen being the suns that dot the landscape. It’s akin to many other ambient titles where the minimalistic graphics combined with the soothing background music make for a very pleasing game experience. The simple graphics are also due in part to the fact that Auralux is also available on Android and whilst many handsets are capable of producing much more elaborate visuals than what Auralux has that narrows the potential market for this game significantly. All that being said it’d probably look a whole lot better on a smaller screen so I’m probably being a bit harsh in that regard. As I alluded to earlier the core game of Auralux is incredibly simple. 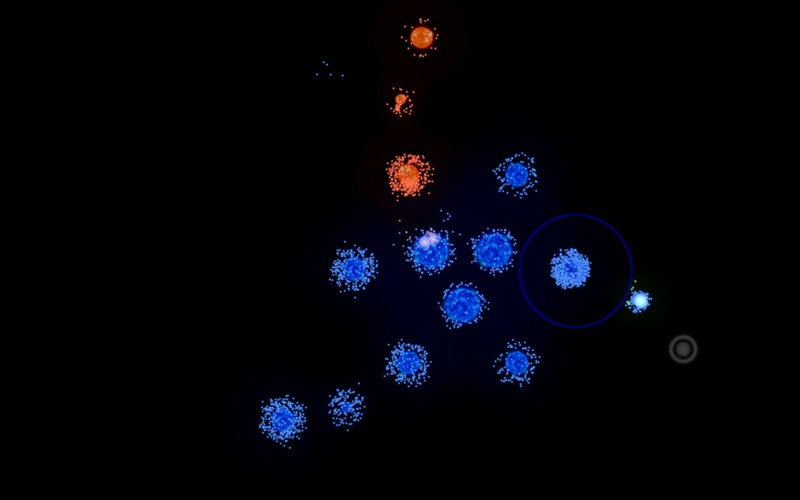 You start off with a sun that produces little dots that you can use to take over other, unoccupied suns or to upgrade your own if its capable of doing so. Those same little dots are also your battle units and you can use them to take over other suns owned by the other players. That’s essentially it and the rest of the game is played inside your head as you work out the best strategy to overcome your foes and inevitably take over the entire board with your glowy blue goodness. Initially the odds are heavily stacked in your favour with you usually starting from a position of power strategically. This serves as the tutorial of sorts as whilst the game play is refined down to the absolute basics its still very easy for you to get into a position that you can’t recover from. The games are also slow and methodical at the start, encouraging you to take your time with each move and consider the best path of action before committing all your available units to it. It’s a good introduction to the idea but it eventually starts to wear thin as you sometimes have to wait for a significant amount of time to pass before you’re able to progress to the next stage. 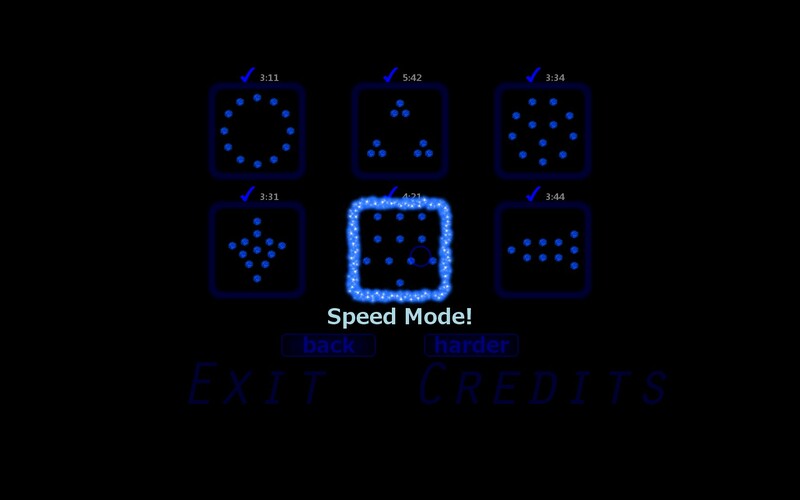 Thankfully the developer behind Auralux realised this and after a few levels you’re able to unlock “speed mode” which allows you to play the exact same game sped up significantly. This turns matches that would last 10~20 minutes into 5 minute affairs something that is definitely required considering how long it can take to build up and move your army around the map. Once I unlocked the mode I didn’t play it any other way and still managed to eek out a couple hours worth of game time and I didn’t feel like I missed out on anything by doing so. The bulk of the game stays in either the stacked in your favour or equal footing level of difficulty where you can get by with relatively unimaginative strategies. The last quarter or so puts you in situations where the odds are clearly stacked against you, usually either starving you of resources compared to your competitors or putting you in a really non-strategic position. These maps are the ones that require an incredible amount of strategy to conquer and I can say that these maps took up the vast majority of my total game time. Something that I feel is key to understanding this game (that is only made clear to you in one of the tips that’s quite easy to miss) is that whilst the AI appears to work differently on different levels it is in fact identical across the board. Now it’s not strict as far as I can tell, it will make different decisions when two options are basically equal, but the way it operates stays the same no matter the map you’re on. Considering the matches are essentially a free for all (or more realistically a 2v1) the game then is usually to get the 2 computers to fight each other so you can quietly build up an army and devastate them before they can retaliate. Indeed the only advantage you have as a human in this game is the fact that you’re able to think non-linearly. The screenshot below is an example of this as the AI has the terrible habit of putting all of its available units on the front lines leaving its production at the rear incredibly exposed, letting me swoop in to get it. Now if you play like the AI does you’re pretty much guaranteed to lose as the AI is very aware of when 2 of its opponents are duking it out and will take advantage of this so the way to win most games is to wait for an opportunity like the one below and make yourself an unattractive target for the other AI. There may be other ways to win but this was the only way I found to win consistently and even then I’d sometimes lose because both the AIs figured out I was an easier target then the other AI, devastating me in a short time. Whilst the metagame might not be as rich as other RTS titles it’s still thoroughly enjoyable when you manage to pull off an incredibly risky maneuver that gives you the game winning advantage. It’s true that this is probably the simplest game that you could still reasonably call a RTS and whilst that’s an achievement in itself it also means that the variety of game play possible is also limited. The replayability of Auralux isn’t particularly high if you approach it like a traditional game but for a timewaster on a phone I can see it having quite a long life. Auralux then is one of those curious indie games that, by necessity, strips back all extravagances in favour of a solid core game mechanic. Auralux does it well and I’d struggle to find anything simpler that could still be realistically called a RTS, even from 2 decades when games had to be simple. Whilst I might’ve cursed its name for the apparent randomness and the AIs ganging up on me I came to realise that it’s all part of the higher order strategy required to conquer your opponents. For RTS fans and casual gamers alike there’s much to love in Auralux and I’d heartily recommend a play through. 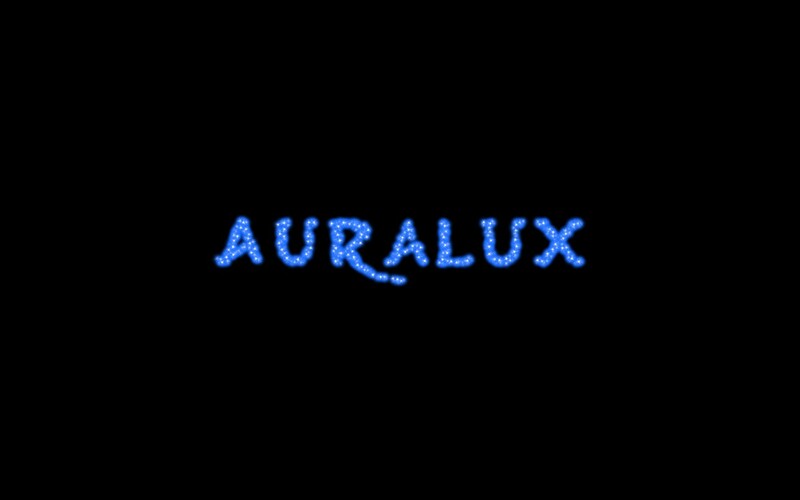 Auralux is available on PC and Android for $4.99 and free respectively. Game was played entirely on the PC with about 3 hours of total play time.